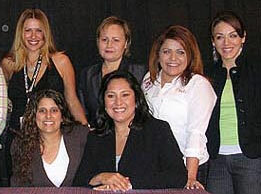 Arrowhead Credit Union and Altura Credit Union were among the major sponsors of the seventh annual Latina Conference, presented in Ontario by Hispanic Lifestyle Magazine. The empowerment conference, whose theme was The Keys of Leadership, was held at the Ontario Airport Hilton in Ontario, CA and attracted a gathering from throughout Southern California. Among those attending were representatives from Arrowhead CU and Orange County’s CU, and League International Relations Manager Letty Cordon-Hernandez. The conference featured workshops, keynote addresses by Congresswoman Loretta Sanchez (D-47th District) and state Senator Nell Solo (D-32nd District), and exhibitors. Other speakers included Rialto Mayor Grace Vargas and Crafton Hills College President Gloria Macias-Harrison. There were also two panel discussions: on careers in broadcasting presented by staff members from KTLA-TV, and on living, food, business, and family presented by television hostesses Chef Lala and Jill-Michelle Melean, and singing artist Karina Nuvo. During her lunch keynote address, Congresswoman Sanchez spoke about three days that look “her breath away.” When she became the first person in her family to get a college diploma; when she won her first election to Congress in 1996 by 984 votes; and when she and her sister, Linda Sanchez, were sworn in together as congresswomen, becoming the first two sisters to do so. She encouraged attendees to do great things. “You are the future leaders of this country. Go out and get it done,” she said.